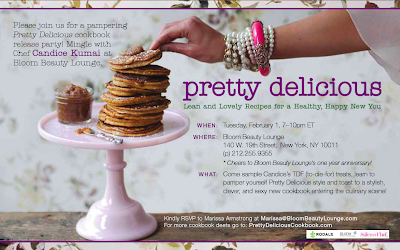 Come raise a glass to a super stylish cookbook at Bloom Beauty Lounge! Enjoy an evening of pampering to promote the new cookbook, Pretty Delicious. Mingle with author and enjoy tons of her TDF (to-die-for) treats all night! -Learn how to pamper yourself from your pantry with a number of recipes for at home treatments and remedies. -Gift Bags for the first 200 people that attend! You MUST RSVP in order to attend the party! Please call (212-255-9355) or e-mail (marissa@bloombeautylounge.com) us to reserve your spot! If you'd like to bring a guest, please mention them when you RSVP.